Salicylates are agents found in hundreds of over-the-counter (OTC) medications and in numerous prescription drugs. These medications possess anti-inflammatory, analgesic, and antipyretic properties. They are available for ingestion as tablets, capsules, and liquids. Acetylsalicylic acid is colorless or white in a crystalline, powder, or granular form. The chemical used in this drug is odorless and is soluble in water. Many people are using Aspirin as an anti-inflammatory agent to treat soft tissue and inflammation in the joints. 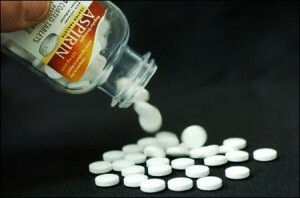 Thrombosis is also prevented with a low dose of Aspirin. Phase 1 of the toxicity is characterized by hyperventilation resulting from direct respiratory center stimulation, leading to respiratory alkalosis and compensatory alkaluria. Both potassium and sodium bicarbonate are excreted in the urine. This phase may last as long as 12 hours. In phase 2, paradoxic aciduria in the presence of continued respiratory alkalosis occurs when sufficient potassium has been lost from the kidneys. This phase may begin within hours and may last 12-24 hours. Phase 3 includes dehydration, hypokalemia, and progressive metabolic acidosis. This phase may begin 4-6 hours after ingestion in a young infant or 24 hours or more after ingestion in an adolescent or adult. Hyperthermia is an indication of severe toxicity, especially in young children. Call the Poison Control Center. Bring the patient to the nearest hospital. Induce gastric emptying: emesis or lavage. Give activated charcoal to absorb aspirin. A cathartic may be given with charcoal to help assure intestinal cleansing. Support patient with intravenous infusions as prescribed to establish hydration and correct electrolyte imbalances. Enhance elimination of salicylates as directed by forced dieresis, alkalinization of urine, peritoneal dialysis or hemodialysis according to severity of intoxication. Monitor serum salicylate level for efficacy of treatment. Administer specific prescribed pharmacologic agent for bleeding and other problems.